The marbled cat is about the size of a domestic cat. Its head and body length is 45 - 62 cm (18 - 24") and it weighs 2 - 5 kg (4 - 11 lb). Its tail is extremely long and bushy. The background color of its fur varies from dark gray-brown through yellowish gray to red-brown. The flanks and back are strikingly marked with large, irregular, dark-edged blotches. The legs and underparts are marked with black dots, and the tail is marked with black spots and rings. There are spots on the forehead and crown, which merge into narrow longitudinal stripes on the neck and irregular stripes on the back. The marbled cat is primarily an animal of moist tropical forest, but there is only anecdotal information on the specificity of its habitat requirements. The range of habitat types the species has been recorded in includes mixed deciduous-evergreen forest areas, mountainous evergreen forest, secondary forest, clearings, six-year-old logged forest, and Dipterocarp forest. It has been found from sea level to 3000 m (10,000'). Birds and/or rodents have been reported as likely forming a major part of its diet. Although previously the marbled cat was considered to be primarily nocturnal (Nowell & Jackson 1996) , recent studies have shown that it can be cathemeral, with observations of the cat having been made throughout the day. Observations of marbled cats in the wild have indicated arboreal and terrestrial habits. The marbled cat is found in northern India, Nepal, Guangxi and Yunnan provinces in China, and south through Cambodia, Laos, Myanmar, Thailand, Viet Nam, peninsular Malaysia, Sumatra (Indonesia), and Borneo. Throughout its range it is thought to be rare, although it has also been suggested that the perception of the marbled cat's rarity may be caused by its secretive nature and its preference for remote forest areas. Because of its dependence on forest habitat, the major threat to the marbled cat is habitat destruction caused by felling of trees and the traditional, shifting, "jhum" method of local cultivation. The marbled cat is also thought to be intolerant of human disturbance, abandoning a forest that is even moderately disturbed. Poaching for skins, bones and meat may also be a threat. 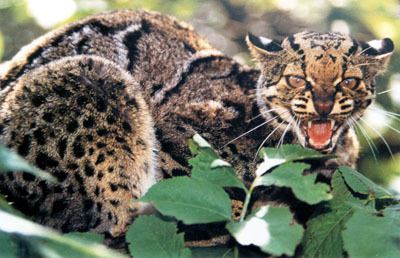 The marbled cat’s total effective population size is estimated at below 10,000 mature breeding individuals (IUCN 2005) . The head and body length of the marbled cat is 45 - 62 cm (18 - 24") and it weighs 2 - 5 kg (4 - 11 lb) (Sunquist & Sunquist 2002) . 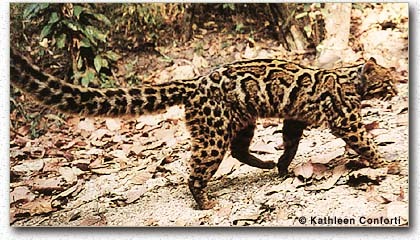 The marbled cat is found in the Himalaya, Indo-Burma, and Sundaland Biodiversity Hotspots (Cons. Intl. 2005). 21 - 22 months (captivity) (Sunquist & Sunquist 2002) . Estimated to vary from 66 - 82 days (captivity) (Sunquist & Sunquist 2002) . Two litters were born in January and February; another in September (Sunquist & Sunquist 2002) . Litter size: 1 - 4 (captivity) (Nowell & Jackson 1996) . Captive kittens begin accepting meat at 121 days (Humphrey & Bain 1990) . At least 12 years and 3 months (captivity) (Sunquist & Sunquist 2002) . Birds and/or rodents (such as squirrels and rats) have been reported as likely forming a major part of its diet, and possibly lizards and frogs are consumed (Sunquist & Sunquist 2002, Scott et al. 2004) . Although previously the marbled cat was considered to be primarily nocturnal (Nowell & Jackson 1996) , recent studies have shown that it can be cathemeral, with observations of the cat having been made throughout the day and not indicating a crepuscular bias (Holden 2001) . Observations of marbled cats in the wild have indicated arboreal and terrestrial habits (Grassman et al. 2005) . A female marbled cat who was radio-tracked for a brief period in the Phu Khieo Wildlife Sanctuary in Thailand was using an area of 5.8 sq km (2.2 sq mi) (Sunquist & Sunquist 2002) .